This two slice version Cuisinart has inch and a half wide slots for ease in placing and retrieving even larger, thicker toastable items. At nine hundred watts, the CPT-160 Classic's functions include defrost and bagel buttons with LED indicators, reheat, and a six setting browning dial. The toaster shuts off automatically at the end of the cycle. The housing is brushed stainless steel with black and chrome accents. This model comes with a slide out crumb tray, cord wrap feature, and a three year limited warranty. While uneven toasting issues are still a factor with this model (as in Cuisinart toasters in general), the CPT-160 BCH appears to be better than its fellows in the Cuisinart line. People really like the easy cleanup possible when a slide out crumb tray is offered. 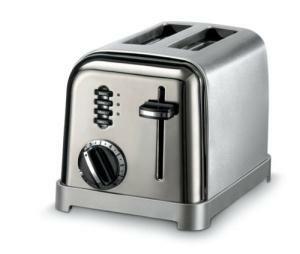 Users don't rave about the Classic, but they appreciate that it more consistently creates decent toast and they like having setting options such as the defrost this toaster offers. The unit does have a unique, retro look and it is very handy to be able to stop the toasting process at the push of a button. Clearly labeled buttons and the knob for browning will make this model easier to use for younger and older family members. The cleats under the toaster are an interesting twist on cord storage solution.